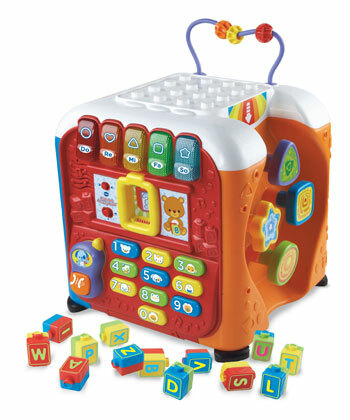 The Alphabet Activity Cube from VTech is designed for infants and toddlers 9-36 months old, and focuses on building developmental skills. The cube is a great height for infants and toddler to support them in pulling up and standing, and chock-full of interactive cause and effect, musical, numeral and alphabet activities. The Alphabet Activity Cube includes 13 building blocks with all 26 letters of the alphabet on them, which can be stacked to build structures on top of the cube, or snapped into the block reader to hear more about each letter. There’s piano keys, a phone and number keypad that engage their little fingers with motor skills, along with a pin maze, shape sorter (with storage! ), turning gears and a mirror. The Alphabet Activity Cube will be available starting in Fall 2012, on Amazon, and at Target, Wal-Mart, Toys R Us and other major retailers. Suggested retail price will be $49.99. Before you buy this test the block reader. On the unit I bought, and every other unit in the store, the unit misred the block, calling a B a C, for example, nearly twenty percent of the time. Who needs a toy that teaches the alphabet, badly?